J.J. Ziegler-Mauler is found in Mittelwihr, housed in very modest premises near the square. With only 4.5 hectares and a marketing budget close to zero Ziegler-Mauler belongs to a category of producers that have not yet been discovered by tourists, unlike the French vinmagasinen La Revue du Vin de France and Gault et Millau, who lavishes praise on the company. 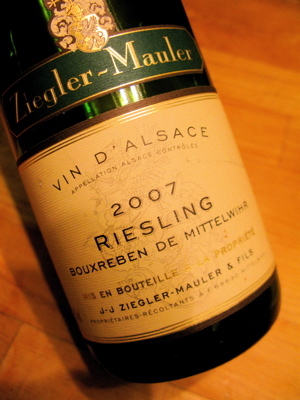 2007 Riesling Bouxreben from Ziegler-Mauler in Mittelwihr comes from a lieu-dit near the municipal boundary to Riquewihr. The aroma is intense, between youth and maturity, with hints of roasted nuts, dried fruit and ripe yellow apple. The taste is dry with massive fruit, supported by a good, ripe acidity and a good minerality. A wine with personality. Price: €8. When you are about to taste, or even judge a wine in order to publish your thoughts you undertake a great responsibility. Personally I never convey my first impressions of a wine, I have always tasted the wine at least twice until I write about it. And since no taster get it right every time, I never give negative criticism to any wine or any producer. 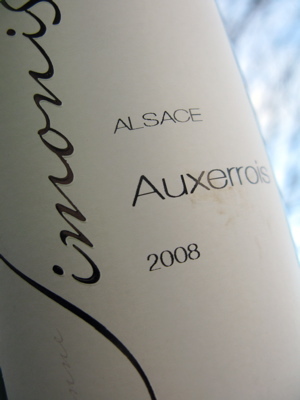 2008 Auxerrois from Etienne Simonis in Ammerschwihr has brilliant. medium-deep colour with a tint of grey. The aroma is extremely fruity with pear. pineapple and toffee. The taste is elegant, and surprises with an almost sandy structure from refined tartric acids balancing the perfectly. A wine justly noted as "Coup de coeur" by La Revue du Vin de France. Price: € 5. There are a few producers in Alsace - and perhaps in all of France - which only makes great wines. Frome these few you will encounter nothing obscure, no ups-and-dows and just a natural vintage variation. However, you will find the personality and character in abundance. One of these magicians are Kientzler, who cultivates 10 ha in Ribeauvillé and Bergheim, with the Grands Crus Geisberg and Osterberg as top names. You can find the discrete domaine along the road to Bergheim, surrounded by vines. 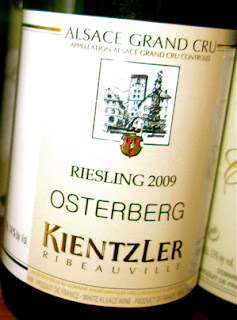 2009 Riesling Grand Cru Osterberg from Kientzler in Ribeauvillé has medium yellow, blazing colour. The nose is a little stiff and restrained at the moment, but rich in minerals. Perfectly crafted flavour with great structure, nice acidity and rich fruit hidden under layers of youthful fruit. This will become a great wine! Price: € 23.